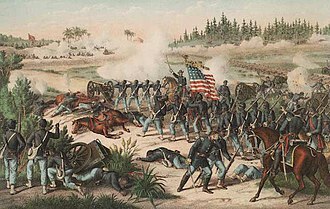 The Battle of Olustee or Battle of Ocean Pond was fought in Baker County, Florida on February 20, 1864, during the American Civil War. It was the only major battle fought in Florida during the war. Union General Truman Seymour had landed troops at Jacksonville, aiming chiefly to disrupt Confederate food supply. Meeting little resistance, he proceeded towards the state capital of Tallahassee, against orders, assuming that he would face only the small Florida militia. Confederates in Charleston sent reinforcements under General Alfred H. Colquitt and the two armies collided near Ocean Pond in Olustee. The Union forces were repulsed and retreated to Jacksonville where they stayed for the remainder of the war. 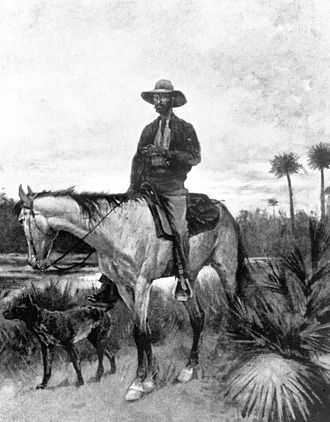 In February 1864, Major General Quincy A. Gillmore, commander of the Union's Department of the South at Hilton Head, South Carolina, ordered an expedition into Florida to secure Union enclaves, sever Confederate supply routes (especially for beef and salt), and recruit black soldiers. Brigadier General Truman Seymour, in command of the expedition, landed troops at Jacksonville, in an area already seized by the Union in March 1862. Seymour's forces then made several raids into the northeast and north-central Florida. During these raids, he met little resistance, seized several Confederate camps, captured small bands of troops and artillery pieces, liberated slaves, etc. However, Seymour was under orders from Gillmore not to advance deep into the state. The battle was the only major one in Florida. 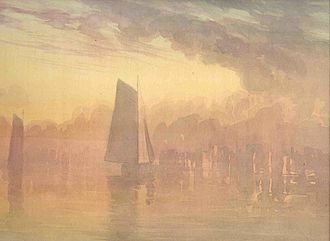 Seymour's preparations at Hilton Head had concerned the Confederate command in the key port city of Charleston, South Carolina. General P. G. T. Beauregard, correctly guessing Seymour's objective was Florida, felt these Union actions posed enough of a threat for him to detach reinforcements under Georgian Alfred H. Colquitt to bolster Florida's defenses and stop Seymour. Colquitt arrived in time to reinforce Florida troops under the command of Brigadier General Joseph Finnegan. As Colquitt's troops began arriving, Seymour, without Gillmore's knowledge, began a new drive across north Florida with the capture of Tallahassee as a possible objective. Following the Florida, Atlantic and Gulf Central Railroad, Seymour led his 5,500 men in the direction of Lake City. At approximately 2:30 in the afternoon of February 20, the Union force approached General Finnegan's 5,000 Confederates entrenched near Olustee Station. Finnegan sent out an infantry brigade to meet Seymour's advance units and lure them into the Confederate entrenchments, but this plan went awry. The opposing forces met at Ocean Pond and the battle began. Seymour made the mistake of assuming he was once again facing Florida militia units he had previously routed with ease and committed his troops piecemeal into the battle. Finnegan and Seymour both reinforced their engaged units during the afternoon and the battle took place in open pine woods. The Union forces attacked but were savagely repulsed by withering barrages of rifle and cannon fire. The battle raged throughout the afternoon until, as Finnegan committed the last of his reserves, the Union line broke and began to retreat. Finnegan did not exploit the retreat, allowing most of the fleeing Union forces to reach Jacksonville. However, the Confederates did make a final attempt to engage the rear element of Seymour's forces just before nightfall, but they were repulsed by elements of the 54th Massachusetts Volunteer Infantry Regiment and the 35th United States Colored Troops, both composed of black soldiers. The Confederate cavalry commander received criticism for failing to pursue the retreating Union forces. Graves of unknown Confederate soldiers killed at Olustee or died in Confederate hospitals located in Lake City, Florida. Union casualties were 203 killed, 1,152 wounded, and 506 missing, a total of 1,861 men—about 34 percent. Confederate losses were lower: 93 killed, 847 wounded, and 6 missing, a total of 946 casualties in all—but still about 19 percent. Union forces also lost six artillery pieces and 39 horses that were captured. 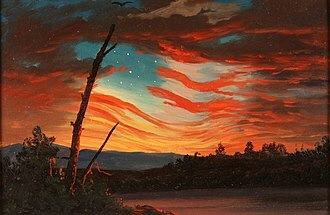 The ratio of Union casualties to the number of troops involved made this the second bloodiest battle of the War for the Union, with 265 casualties per 1,000 troops. Soldiers on both sides were veterans of the great battles in the eastern and western theaters of war, but many of them remarked in letters and diaries that they had never experienced such terrible fighting. The Confederate dead were buried at Oaklawn Cemetery in nearby Lake City. The Union losses caused Northern authorities to question the necessity of further Union involvement in the militarily insignificant state of Florida. According to Confederate memoirs and letters, Confederate troops killed most of the wounded and captured black Union soldiers. Survivors of the Battle of Olustee at the dedication of the battlefield monument on October 23, 1912. On the morning of February 22, as the Union forces were still retreating to Jacksonville, the 54th Massachusetts was ordered to countermarch back to Ten-Mile Station. The locomotive of a train carrying wounded Union soldiers had broken down and the wounded were in danger of capture. When the 54th Massachusetts arrived, the men attached ropes to the engine and cars and manually pulled the train approximately three miles to Camp Finnegan, where horses were secured to help pull the train. After that, the train was pulled by both men and horses to Jacksonville for a total distance of 10 miles (16km). It took 42 hours to pull the train that distance. In the South, the battle was seen as a spirit-raising rout. One Georgia newspaper referred to Union forces as walking "forty miles over the most barren land of the South, frightening the salamanders and the gophers, and getting a terrible thrashing..."
Today, the battlefield is commemorated by the Olustee Battlefield Historic State Park, a part of the Florida State Park system. This park is located within the Osceola National Forest, on U.S. 90. The actual battlefield consists of the state park, part of the national forest and privately held land on the south side of U.S. 90. There is an annual historical reenactment that takes place on the site of the battle, and nearby Lake City (in Columbia County) has hosted the yearly Olustee Battle Festival, a separate event, since 1976. On Presidents' Day weekend each February (see Citations), thousands of reenactors from across the U.S., and even from overseas, come to the Park to reenact the Battle of Olustee. Reenactors begin arriving as early as Thursday to set up. Friday is "School Day" as thousands of students arrive to spend the day watching demonstrations and listening to living historians discuss various aspects of the war and life in the United States during the 1860s. The public is invited to attend the event on Friday, Saturday and Sunday, visit the camps, view demonstrations, interact with living historians, shop at numerous sutler tents for Civil War merchandise, and attend the battles on Saturday and Sunday. A large selection of modern-day food is available from Friday through Sunday inside the park. The reenactment of the Battle of Olustee is co-sponsored by four organizations: the Olustee Battlefield Historic State Park Citizens Support Organization; the Florida Department of Environmental Protection – Recreation and Parks; the USDA Forest Service – Osceola National Forest; and The Blue-Grey Army, Inc. The lithograph at the top of the page was printed by the firm of Kurz and Allison in 1894. It depicts soldiers of the 8th U.S. Colored Troops advancing against Confederate entrenchments. While frequently used in media about the Battle of Olustee, it is inaccurate as the artist knew little about the battle. The Confederates troops during the battle were well in advance of their prepared positions, and neither side fought from behind fortifications, as the battle took place in a pine forest (see map – top of the map is approximately due West). Plus, there were very few large cleared areas (as also shown incorrectly in the lithograph). The dotted red line on the map indicates the location of the Confederate trenches. ^ a b "The Battle of Olustee". battleofolustee.org. Archived from the original on November 10, 2013. Retrieved February 20, 2014. ^ a b c d "American Battlefield Protection Program Battle Summary". 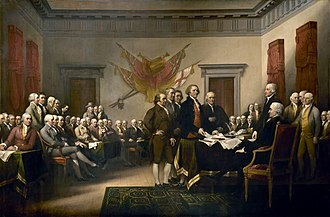 History. National Park Service. Archived from the original on May 19, 2007. Retrieved December 31, 2007. ^ a b c d e f g Wynne, Lewis N. & Taylor, Robert A. (2001). Florida In The Civil War. Arcadia Publishing. ISBN 0-7385-1368-7. ^ a b c d e f g "Battle of Olustee". Archived from the original on September 17, 2008. ^ Combined Books, ed. (2008). The Civil War Book of Lists. Book Sales, Inc. p. 97. ISBN 978-0-7858-1702-4. ^ "Olustee Battlefield". Florida Public Archaeology Network. Archived from the original on March 14, 2014. Retrieved March 13, 2014. ^ Emilo, Luis. (1995). A Brave Black Regiment. De Capo Press. ISBN 0-306-80623-1. ^ Schmidt, Lewis (1995). The Civil War in Florida: A Military History. self-published. ^ a b Olustee Battlefield Historic State Park Archived June 22, 2015, at the Wayback Machine Florida State Parks. Retrieved September 27, 2010. ^ a b Olustee Battlefield Reenactment Archived August 1, 2008, at the Wayback Machine Battle Of Olustee Web site. Retrieved August 17, 2008. Boyd, Mark F. 1950. The Federal Campaign of 1864 in East Florida. Florida Historical Quarterly. Vol. XXIX, No. 1. Combined Books (editors). 2008. The Civil War Books of Lists. Book Sales, Inc. ISBN 0-7858-1702-6. Nulty, William H. 1990. Confederate Florida: The Road to Olustee. University of Alabama Press. ISBN 0-8173-0748-6. Schmidt, Lewis B. 1989. The Civil War in Florida, A Military History, Vol. II: The Battle of Olustee. Allentown, PA.
Wikimedia Commons has media related to Battle of Olustee. The sound was guarded by two forts on opposite sides of the entrance, Fort Walker on Hilton Head Island to the south and Fort Beauregard on Phillips Island to the north. A small force of four gunboats supported the forts, but did not materially affect the battle, the attacking force assembled outside of the sound beginning on November 3 after being battered by a storm during their journey down the coast. Because of losses in the storm, the army was not able to land, the fleet moved to the attack on November 7, after more delays caused by the weather during which additional troops were brought into Fort Walker. His plan soon broke down and most ships took enfilading positions that exploited a weakness in Fort Walker, the Confederate gunboats put in a token appearance, but fled up a nearby creek when challenged. Early in the afternoon, most of the guns in the fort were out of action, a landing party from the flagship took possession of the fort. 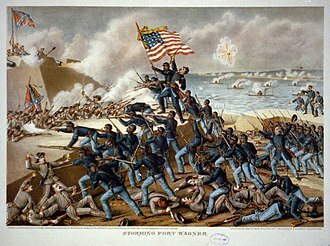 When Fort Walker fell, the commander of Fort Beauregard across the sound feared that his soldiers would soon be cut off with no way to escape, another landing party took possession of the fort and raised the Union flag the next day. Despite the heavy volume of fire, loss of life on both sides was low, at least by standards set in the Civil War, only eight were killed in the fleet and eleven on shore, with four other Southerners missing. Total casualties came to less than 100, the problems of the blockade were considered by a commission appointed by Secretary of the Navy Gideon Welles. Chairman of the commission was Capt. Samuel Francis Du Pont, the commission stated its views of the South Carolina coast in its second report, dated July 13. In order to improve the blockade of Charleston, they considered seizing a nearby port and they gave particular attention to three, Bulls Bay to the north of Charleston, and St. Helena Sound and Port Royal Sound to the south. The latter two would be useful in the blockade of Savannah and they considered Port Royal to be the best harbor, but believed that it would be strongly defended and therefore were reluctant to recommend that it be taken. Shortly after the bombardment of Fort Sumter in Charleston Harbor had started the war, Beauregard did not believe that Port Royal Sound could be adequately defended, as forts on opposite sides of the sound would be too far apart for mutual support. Atlanta ran aground while attempting to break the Union blockade, and after a short battle surrendered to the Union forces. Captain Rodgers became a hero, and he was promoted to Commodore. Captain John Rodgers in Weehawken had overall command of this Union force, Webb dropped anchor at 8,00 p. m. and spent the remainder of the night coaling. CSS Atlanta, accompanied by wooden steamers CSS Isondiga and CSS Resolute, a percussion torpedo was fitted to a long spar projecting forward from the rams bow which Webb intended to detonate against the Weehawken. During battle maneuvers the Atlanta suddenly ran aground and swayed at an angle which made it difficult to shoot, the USS Weehawken held fire until it was at 300 yards and pounded the immobile ship. The USS Nahant had drawn the fire of the CSS Atlanta allowing the USS Weehawken to draw within firing distance, the battle lasted only a few minutes, and the Atlanta became the first Confederate ironclad to surrender to the Union. Meanwhile, the two boats escorting the Atlanta scurried upriver for safety, the CSS Atlanta suffered the sole fatality of the battle, as well as 16 wounded. The Siege of Port Hudson, was the final engagement in the Union campaign to recapture the Mississippi in the American Civil War. While Union General Ulysses Grant was besieging Vicksburg upriver, General Nathaniel Banks was ordered to capture the Confederate stronghold of Port Hudson, when his assault failed, Banks settled into a 48-day siege, the longest in US military history. A second attack failed, and it was only after the fall of Vicksburg that the Confederate commander. This left the Mississippi open to Union navigation from its source to the Gulf of Mexico, from the time the American Civil War started in April 1861, both the North and South made controlling the Mississippi River a major part of their strategy. The Confederacy wanted to keep using the river to transport needed supplies, particularly important to the South was the stretch of the Mississippi that included the mouth of the Red River. In the spring and early summer of 1862, the Union advanced their control of the Mississippi from both the north and the south, a second Union fleet commanded by Charles H.
Davis occupied Memphis, after defeating Confederate riverine forces in Battle of Memphis. To make sure it could continue to use the section of the river. The initial idea of fortifying the heights of Port Hudson came from the master of fixed defenses, General Pierre G. T. Beauregard, Army of the Mississippi. ”In June 1862, Major General Earl Van Dorn wrote Jefferson Davis, “I want Baton Rouge and Port Hudson” A few days after the fall of Baton Rouge to the Union. Breckinridge with 4,000 men, carried out the wishes of General Van Dorn by occupying Port Hudson, soldiers of the 4th Louisiana Infantry arrived at the site on August 15,1862. According to historian John D. Winters, Port Hudson, unlike Baton Rouge, was one of the strongest points on the river and it was a position similar to that of Quebec City in the French and Indian War. The political momentum behind the Union actions against Port Hudson came from the elections of November 1862, the Republican base, centered in Ohio and Illinois, had been shaken by embarrassing Democratic victories. A dramatic letter from Indiana Governor Oliver P. Morton to Lincoln claimed “The fate of the North-West is trembling in the balance. ”His implication was that unless the independent trade of Union states along the Ohio River was restored by Union control of the entire Mississippi, further breakup of the Union was possible. Morton believed the states of Ohio and Illinois were in danger of breaking away from the Northeast to join the Confederacy, the threatening political fractures galvanized the Lincoln administration into action. Major General Nathanial Banks was diverted from an expedition to Texas and given Benjamin Butler’s command of the Department of the Gulf. ”On December 4,1862, Banks. In May 1863, Union land and naval forces began a campaign they hoped would give control of the full length of the Mississippi River. Banks simultaneously attacked Port Hudson, which stood at the southern end, Port Hudson was sited on an 80 feet bluff on the east bank above a hairpin turn in the Mississippi River 25 miles upriver from Baton Rouge. The Battle of Gainesville was fought on 17 August 1864, when a Confederate force defeated Union detachments on a raid from the Union garrison in the Jacksonville, area. However, the other and first Battle of Gainesville was fought on 14 February 1864, site of a railroad junction and depot in north central Florida, was the scene of two small-scale engagements during the war. On 14 February 1864, the first battle occurred when about 50 Union troops entered the city intending to capture two trains. Company H of the 2nd Florida Cavalry with 130 men attempted to repulse this raid, but were defeated by the Union force, which successfully returned to Jacksonville after holding the town. 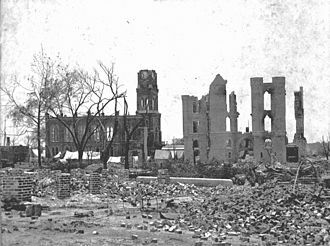 The Battle of Gainesville took place on 17 August 1864, in the town square, a Union column of 342 men under the command of Col. Andrew L. Harris had occupied Gainesville that morning. It was composed of the 75th Ohio Mounted infantry, 4th Massachusetts Cavalry, Battery A, 3rd Rhode Island Heavy Artillery, dickisons men numbered about 290, although only 175 entered Gainesville and engaged in the fighting. The Battle of St. Johns Bluff was fought from October 1–3,1862, between Union and Confederate forces in Duval County, during the American Civil War. The battle resulted in a significant Union victory, helping secure their control of the Jacksonville area, the St. Johns River was important in the Union effort of taking Florida. If Federals controlled the St. Johns River they could raid Confederate positions in the interior of Florida, the Union wanted to control North Florida and use it as a haven for escaped slaves and use its position to initiate Reconstruction for Florida. Federals first occupied Jacksonville in March 1862, Federal gunboats stationed at Mayport Mills operated up and down the river. The Union victories at Fort Donelson and Fort Henry forced Florida Confederates to go to Tennessee to reinforce the Confederate Army, with few resources Finnegan managed to fortify St. Johns Bluff where Confederate troops used slave labor to construct defenses. This was part of a series of Confederate defensive works that had constructed near Fort Caroline. On September 11 Confederates opened fire on Union gunboat USS Uncas approaching the bluff, the USS Patroon joined the USS Uncas and opened fire on the bluff but failed to destroy the Confederate position. The Union dispatched over 800 soldiers to Florida from South Carolina to take the bluff expecting it to be a challenging obstacle, Union reinforcements arrived on October 1 at Mayport Mills. The next day, Union soldiers under Brigadier General J. M, brannon approached the bluff from the rear. Confederate Colonel Charles F. Hopkins was in a due to the Union reinforcements approaching from the rear. Captain Winston Stephens believed the Confederate position could hold off the Federal assault, Hopkins decided to order a retreat from the Confederate position on October 2–3. Federals occupied the Confederate position and seized the cannons, two days on October 5 the Federals moved on to nearby Yellow Bluff Fort which had retreated. 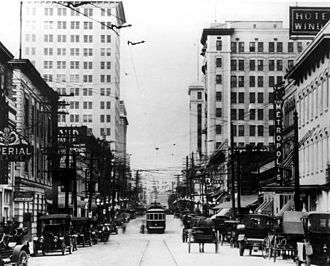 Jacksonville was reoccupied on October 3 after the Union victory at St. The Siege of Fort Pulaski concluded with the Battle of Fort Pulaski fought April 10–11,1862, during the American Civil War. Union forces on Tybee Island and naval operations conducted a 112-day siege, the siege and battle are important for innovative use of rifled guns which made existing coastal defenses obsolete. The Union initiated large scale amphibious operations under fire, the forts surrender strategically closed Savannah as a port. The Union extended its blockade and aids to navigation down the Atlantic coast, the Confederate army-navy defense blocked Federal advance for over three months, secured the city, and prevented any subsequent Union advance from seaward during the war. Coastal rail connections were extended to blockaded Charleston, South Carolina, Fort Pulaski is located on Cockspur Island, near the mouth of the Savannah River. 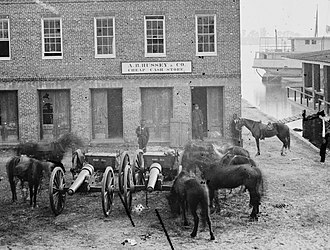 The fort commanded seaward approaches to the City of Savannah and it was commercially and industrially important as a cotton exporting port, railroad center and the largest manufacturing center in the state, including a state arsenal and private shipyards. Two southerly estuaries led to the Savannah River behind the fort, immediately east of Pulaski, and in sight of Hilton Head Island, South Carolina, lay Tybee Island with a lighthouse station. Fort Pulaski was built as a Third System fort in the United States system of defense on land ceded to the United States by the State of Georgia. Authorized by appropriations begun by Congress under the James Madison administration, construction of Third System forts was directed under U. S, Secretaries of War including James Monroe of Virginia, William H. Crawford of Georgia, and John Calhoun of South Carolina. The new construction replaced two earlier forts on Tybee Island, a British colonial fort was torn down in the American Revolution. The first U. S. fort, authorized in the Washington Administration, was away in an 1804 hurricane. Construction began on Fort Pulaski during 1830, and was completed in 1845 in the administration of John Tyler by a successor of U. S. Secretary of War John Bell of Tennessee. The new fort was named to honor Casimir Pulaski, the Polish hero of the American Revolution, a young Lieutenant Robert E. Lee served as an engineer during the construction of the fort, at which time he resided in Savannah, Georgia. The Third System fort expanded Savannahs defenses downriver from Old Fort Jackson, in the campaigns for national elections in 1860, Southern secessionists threatened civil war, were their opponent to be elected President. Following the policy of President James Buchanan and his Secretary of War John B, floyd of Virginia, the newly inaugurated Lincoln Administration at first did not garrison and defend forts, arsenals or U. S. Treasury Mints in the South. The policy was continued until April 12,1861, at Fort Sumter, South Carolina, in late 1861, the commander, Department of Georgia, General Alexander Robert Lawton would transfer to Richmond. On November 5, General Robert E. Lee assumed command of the newly created Department of South Carolina, lawtons October report for his Department listed 2,753 men and officers in the environs of Savannah, almost half of the command. Finnegan was born November 17,1814 at Clones in County Monaghan, Ireland. 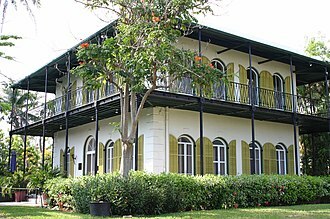 He came to Florida in the 1830s, first establishing a sawmill at Jacksonville, Finnegans successes are perhaps attributable to his first marriage on July 28,1842, to the widow Rebecca Smith Travers. Her sister Mary Martha Smith was the wife of Floridas territorial governor Robert Raymond Reid, at a courthouse auction in 1849, Finnegan paid just forty dollars for five miles of shoreline along Lake Monroe. In 1852, he was a member of the Committee of Vigilance and Safety of Jacksonille and his family included his three stepdaughters Maria and Martha Travers, and children Rutledge, Agnes and Yulee Finnegan. 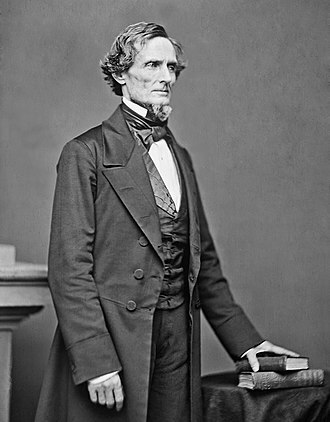 At Floridas secession convention, Finnegan represented Nassau County alongside James G. Cooper, in April 1862, Finnegan assumed command of Middle and East Florida from Brigadier General James H. Trapier. Soon thereafter, he suffered some embarrassment surrounding the wreck of the blockade runner Kate at Mosquito Inlet and her cargo of rifles, medical supplies and shoes was plundered by civilians. Attempts to recover these items took months before he issued a public appeal, most of the rifles were found, but the other supplies were never recovered. At this time, the principal Confederate military post in east Florida was dubbed Camp Finegan to honor the states highest-ranking officer and it was about seven miles west of Jacksonville, south of the rail line near modern Marietta. In 1863, Finnegan complained of the quantity of rum making its way from the West Indies into Florida. Smugglers were buying it in Cuba for a mere seventeen cents per gallon and he urged Governor John Milton to confiscate the vile article and destroy it before it could impact army and civilian morals. Beauregard began rushing reinforcements to Finnegan after Confederate officials became aware of a build-up of Federal troops in the city of Jacksonville. As Florida was a supply route and source of beef to the other southern states. 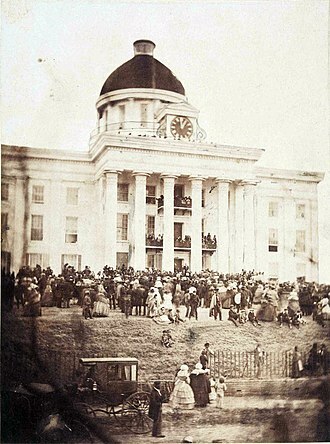 On February 20,1864, Finnegan stopped a Federal advance from Jacksonville under General Truman Seymour that was intent upon capturing the capitol at Tallahassee. Alfred Holt Colquitt was a lawyer, soldier, 49th Governor of Georgia and two-term U. S. Senator from Georgia, dying in office and he served as an officer in the Confederate army, reaching the rank of major general. Alfred Colquitt was born in Monroe and his father, Walter T. Colquitt was a United States Representative and Senator from Georgia. The younger Colquitt graduated from Princeton College in 1844, studied law and he began practicing law in Monroe. During the Mexican-American War, he served in the United States Army at the rank of major, after the war, Colquitt was elected as a member of the United States House of Representatives from 1853 to 1855. 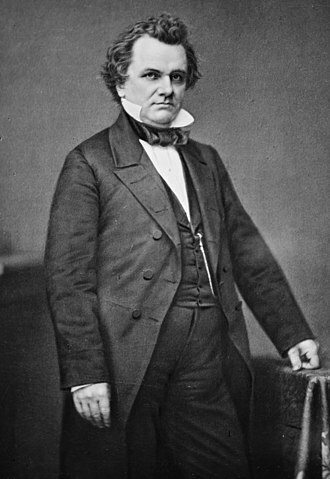 He next was elected to and served in the Georgia state legislature, Colquitt was a delegate to The Georgia Secession Convention of 1861—voting in favor of secession and signing Georgias Ordinance of Secession on January 19,1861. At the beginning of the Civil War, Colquitt was appointed captain in the 6th Georgia Infantry and he saw action in the Peninsula Campaign and the Seven Days Battles. He rose through the ranks to become a general in 1862. He led his brigade under Stonewall Jackson in the Battle of South Mountain, Battle of Antietam, the Battle of Fredericksburg, after Chancellorsville, some questions arose about Colquitts performance during that battle, and his brigade was transferred to North Carolina in exchange for another. His brigade was transferred again in the summer of 1863 to protect Charleston, in February 1864, Colquitt marched his brigade south to help defend against the Union invasion of Florida, and was victorious in the Battle of Olustee. After this battle, Colquitts brigade rejoined Robert E. Lees Army of Northern Virginia, late in the war, the brigade returned to defend North Carolina, where Colquitt surrendered in 1865. After returning to life, Colquitt in 1876 defeated Republican candidate Jonathan Norcross for Governor of Georgia. 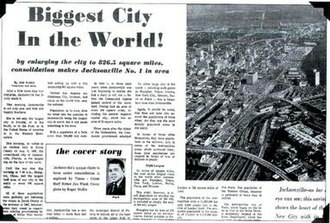 Around that time, several thousand friends asked for about thirty open government jobs and those who did not get one of the jobs tried to turn voters against Colquitt. USS Richmond, wooden steam sloop of the Union fleet. The Manassas proved to be slow and difficult to maneuver on the Mississippi River. 6.4-inch banded rifle, the weapon type used as the bow pivot gun on the CSS Ivy. Note the 100-pound conical projectile at the right rear of the gun carriage. This weapon outranged all of the guns in Pope's fleet. Fort Pulaski under fire April 10–11, 1862. The effect of the Union's innovative Parrott Rifle cannon and percussion shells. Major General Mansfield Lovell, CSA, would not surrender the city. Farragut's flagship, USS Hartford, forces its way past Fort Jackson. Flag Officer David G. Farragut who commanded the Union fleet that broke through to New Orleans. St. Johns Bluff around 1900. Photograph taken September 8, 1863, shows the breach compromised at Fort Sumter's wall facing Morris Island during bombardment of Fort Sumter. The naval party attempted to enter the fort here. Capt. Edmund C. Bainbridge's Battery A, 1st U.S. Artillery, at the siege of Port Hudson, Louisiana, 1863. The grave of Joseph Finegan in the Old City Cemetery of Jacksonville, Florida. The harbor of Pensacola, Florida in 1861. CSS David approaching the USS New Ironsides. USS New Ironsides when the torpedo detonated. "Destruction of the privateer Petrel by the St. Lawrence."